'Michael A. Hoffman II (born January 2, 1957) is an American historian, conspiracy theorist and Holocaust denier'. Anyone disputing 'historian'? Well-read and respected and all that? Yet, defined here, by the second two words. Equals; Dismiss, '...on history'. W: 'Hoffman claims to have operated an organic farm...' Even his own past is a 'claim'. Boy, upward struggle on; Jewish people, places, and problems. Racial divide-up regardless. 'White' people up for disappearance. Grappling with race and identity. The history of secret societies, through religious and institutional writings and their operation. The psychological war upon us. How those purporting to get metaphysical about and; suppose, connect with the unseen. (Nb. While am on links, 'Ronnie' post, had an incorrect link for 'you know interview' -- Sorry 'bout that). OK, am I a Hoffmanite? Not sure know enough. About his thinking, or the world or life we live. Think Jay Dyer offers healthy balance on his views. (Must dig back and get what he said). On Michael's site, starts with; 'Dedicated to love for all of humanity. "Let all that you do be done in love." I Corinthians 16:14'. As mission statements go -- that'll do/me. In his own words: 'One of the most controversial scholars of the 21st century. The Southern Poverty Law Center and ADL seek to shut down his publishing enterprise and ban his books because they can't refute his research and dare not debate him'. 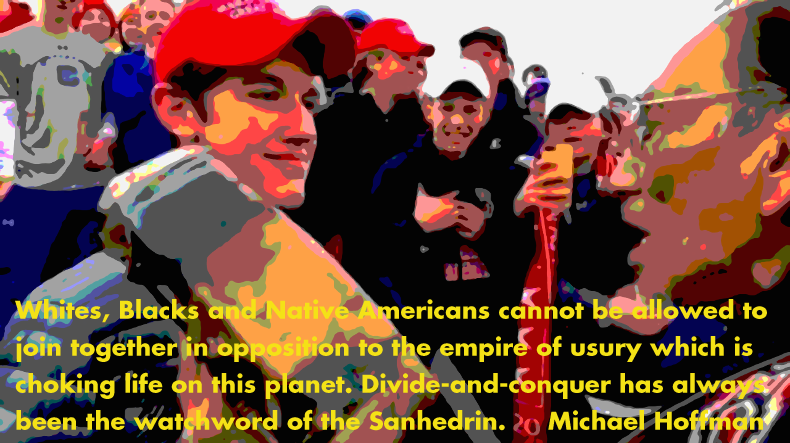 On Unz he writes; Whites, Blacks and Native Americans cannot be allowed to join together in opposition to the empire of usury which is choking life on this planet. Divide-and-conquer has always been the watchword of the Sanhedrin. Whites with their affinity for Neocon war-Zionism, and Blacks with their partiality for the Democratic party of sodomite supremacy, non-educating public schools and unlimited cheap labor from south of the border, remain unconscious, easily manipulated golem of the six-pointed System. Remember the '70s? Real racism-ish. Then came roots and culture, Jamaica meets England. Suddenly with punk overnight, come and gone, UK ablaze with 'the rock against...'. Then came NYC-led early '80s radio. Dance music re-born and the roots of our most 'popular' pop. And fair to say, cultural-shifter with lights down, speakers up and mixing vinyl. Cometh Trump and UKIP etc. Got R-ish, back and ballsy. Pumped up by secret soc. psycho-war -- Michael's field and mastery about -- on the TV from/to, all who whip up lies, left or right, or what have you. Racism is v.rare in the UK, say... or, the US -- in a certain context, and over time. The flood and frenzy as the lid on fake and media are blowing up is desperate and nasty. Haven't read the Unz piece. Got as far as could before two -- of many -- lines had me bomb up a graphic. Be more, quick bam bam, and off. Be well. Thanks for bothering.